CarGurus has 36,683 nationwide Colorado listings starting at $1,799. It's handsome, has a stout diesel engine, and is incredibly versatile, but is the 2016 Chevy Colorado worth its price tag? Midsize pickup trucks offer some advantages over their full-size brethren, like improved fuel economy and the ability to actually fit in city parking spaces. But start shopping around for these svelte trucks and you’ll quickly come to a singular realization: you’re probably going to have to pay more for a smaller truck than a similarly equipped full-size. 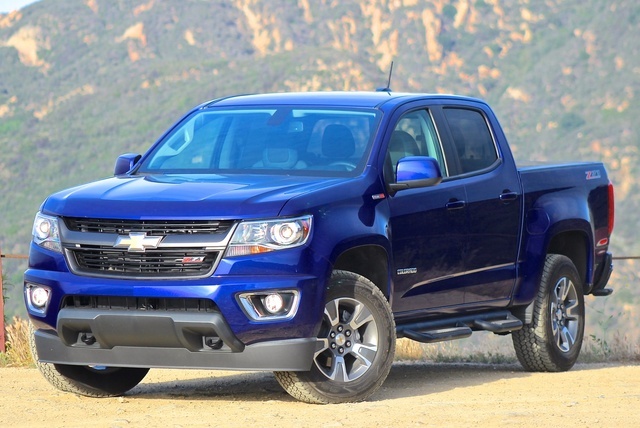 So is it worth paying a premium for the midsize 2016 Chevrolet Colorado? The Chevrolet Colorado is in its second generation. The new version arrived for the 2015 model year, replacing the first generation of the Colorado, which was sold from 2004 to 2012. The second-gen Colorado addressed some of the main critiques of the first model, including sup-par engines and a lackluster interior. This new generation, which carries over from 2015 to this 2016 model, boasts arguably the most fetching exterior appearance of all the available midsize trucks, including the dated Nissan Frontier and the modestly updated Toyota Tacoma. 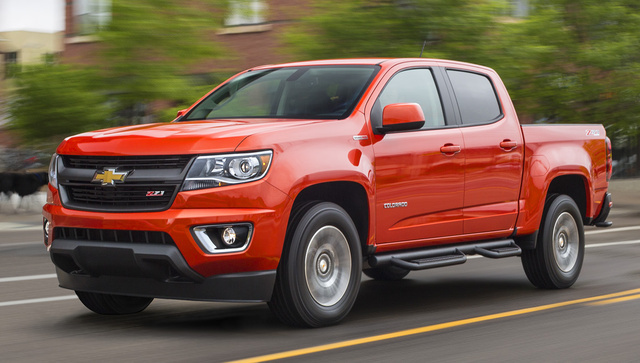 The big bowtie in the split grille makes the Colorado instantly recognizable as a Chevrolet and gives it a fresh, sharp look without directly aping the look of its bigger brother, the Silverado. 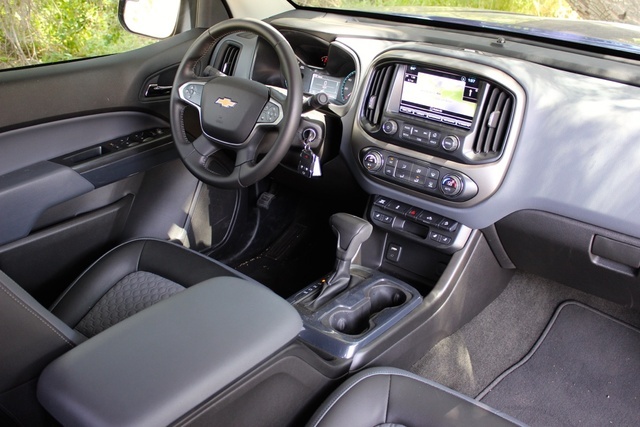 The look of the cabin does take great inspiration from the Silverado and other Chevy models and is better as a result. The clean cabin is dominated by the squared-off center console, featuring the large MyLink touchscreen and large tactile controls for audio and climate. The seats have a sharp look to them as well, bringing together the cabin aesthetic. Trims for the Colorado are the Base, WT, LT, and the Z71, like the one we tested. The Base comes standard with LED headlights, a 6-speaker stereo, power driver’s seat, and a USB port. The LT adds power mirrors, an additional USB port in the center console, and 4G LTE hotspot capabilities. The Z71 features all the best truck gear, including a power-locking tailgate, heavy-duty suspension, all-terrain tires, and remote start. The 2016 Colorado offers two gas engines that carry over from last year and one new powertrain option. The base inline 4-cylinder makes 200 horsepower, while the 3.6-liter V6 puts out 305. That power gets sent through a 6-speed automatic transmission to the rear wheels or available 4-wheel drive (4WD). Neither gas engine provides truly great acceleration or grunt, and the gas I4 can feel downright anemic at times. The V6 is no hot rod either, as I had to confirm that I was actually driving the V6 (and not the I4) when I had it last year. 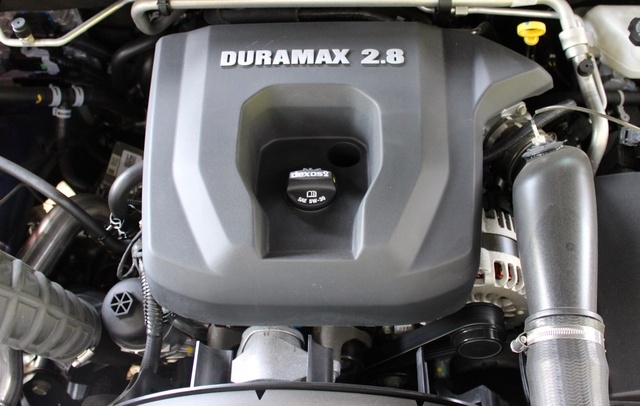 Happily, Chevy now offers a third option, a 2.8-liter 4-cylinder Duramax diesel engine. It makes 181 horsepower and 369 pound-feet of torque and finally makes enough power to give the Colorado some getup. The diesel also makes a very unique sound. The mechanical diesel chatter from the exhaust is very different from the notable sound of a big diesel V8, but it is still recognizable as a diesel. Depending on your personal taste, you’ll either love it or hate it. 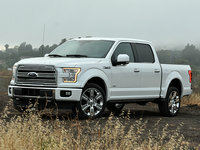 The diesel gets the best fuel economy of the bunch: 22 mpg city/31 highway/25 combined with rear-wheel drive (RWD). Our 4WD diesel gets 20/29/23. The 3.6-liter V6 with 4WD will probably be the most popular combination and gets 17/24/20. For a vehicle of its size, the Colorado has a spacious interior. It's laden with plenty of cupholders and thoughtfully placed storage compartments. The large center-console storage bin has a USB port, and the bin is large enough to fit a tablet for charging. Ahead of the center cupholders is a compartment that features a USB port and audio jack perfectly sized to hold your phone and wallet. One knock on the power front seats is the way they raise and lower. Typically, a power front seat features a cantilever system that raises the seat evenly. These seats feature only half of that lever, so when you raise the seat, you actually tilt forward. It seems like a bit of corner cutting and is a big setback for taller drivers. Thankfully, Chevy has more thoughtful solutions for storage and versatility inside and out. 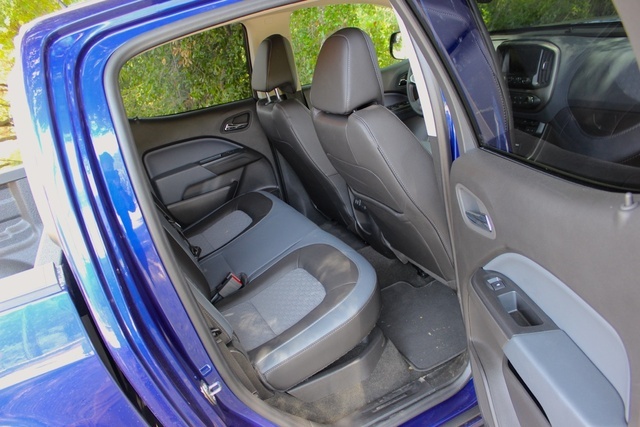 The rear seats have plenty of leg- and headroom. Rear-seat passengers are also treated to a pair of USB ports for devices and a small center armrest that folds out and includes more cupholders. Our test model features a spray-on bed liner, which is an absolute must for truck owners. Drop-in liners are prone to trapping water between themselves and the bed, causing massive rusting, and years of abuse without a liner will hurt any chance of resale or trade in. 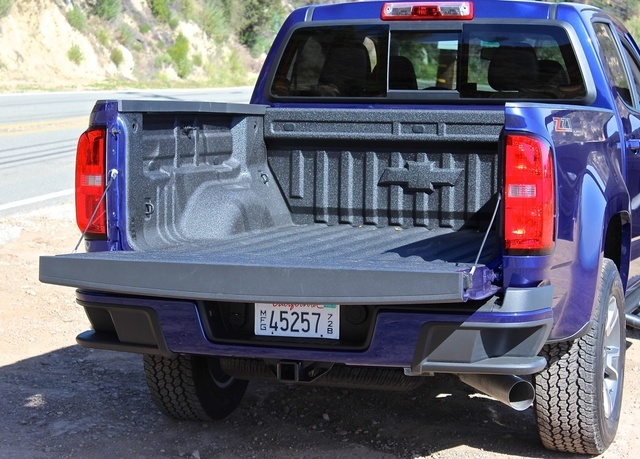 At the corners of the rear bumper are cut-outs that act as steps for getting in and out of the pickup bed. These are far more elegant than the large “man step” you’d get with a Ford F-150, and they have no moving parts and will not break. It's refreshing to see a simple, low-tech solution to a common problem. 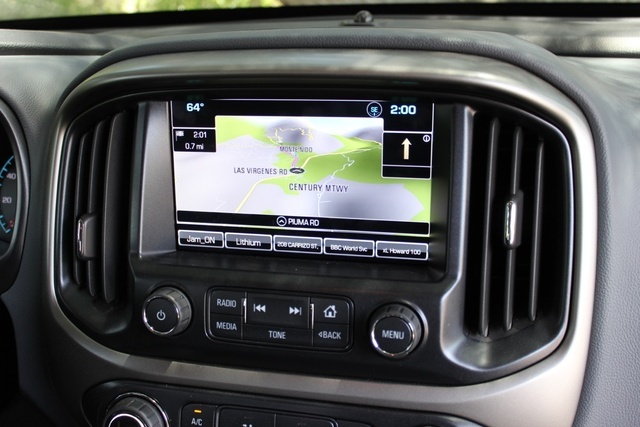 MyLink is Chevrolet’s infotainment system, bridging radio, navigation, and many other functions through the main center screen. Even in the base version, it's housed in a 4.2-inch color screen. Other models get an 8-inch touchscreen. This vivid screen features large fonts and big icons that make it very easy to use. If you can use a tablet, you can use MyLink. You can save a preset simply by holding down one of the many digital preset buttons, and you can switch between AM/FM and SiriusXM seamlessly. You can also press the voice-control button to enter an AM/FM or satellite station without taking your eyes off the road. But changing the station is just the tip of the iceberg for voice controls. The voice-control system can understand complex commands, so you can even speak an entire address, and MyLink will navigate, with turns presented on the digital trip screen in the instrument panel. Plug in an iPhone and you have access to Apple CarPlay. It presents much of your iPhone’s functionality on the touchscreen. You can access your phone and contacts, Apple Maps, music library, and even send and receive text messages via voice control using Siri Eyes Free. One great feature is the ability to look up a destination on your phone and hit Navigate--the system will present your directions on the touchscreen automatically. The Colorado features all the necessary safety features, like dual-stage front impact and side impact airbags and OnStar crash response, which will put you in contact with an emergency responder in the event of a crash. Every Colorado comes with a backup camera, which is crucial for parking this truck. The Colorado is also available with safety features such as lane-departure warning and forward-collision alert. As great as these high-tech safety features are, one of the best features is one of the most low-tech. The driver’s-side mirror has an inset mirror that's wide-angle, like a truck mirror. It's wide enough to cut out the left blind spot. Like the bed step-ups, it's great to see a simple feature that's so helpful. The 2016 Chevrolet Colorado starts at $20,995, but that's for the Extended cab, 4-cylinder, RWD base version. If you want the advertised capability of the Colorado, a 4WD model with the V6 that most people will want bumps the price up to $28,000, and that’s not even for a mid-level LT trim. Spec out a Colorado like our Quad-cab Z71 diesel with options, and you’re looking at a window price of around $42,000. For that kind of money you could get a decently equipped Silverado, with four doors, 4WD, and a good list of options. So why would anyone want to go for the smaller truck at the same price? Because you don’t always need the size. The Silverado has a home at the job site, but the Colorado can navigate cities and be a great truck for bikes, kayaks, lawn equipment, or camping gear. You don’t always need a huge one, but a good pickup bed is a great thing to have. Also, the Colorado is on par with the Nissan Frontier and Toyota Tacoma on price. But those import trucks are long in the tooth, have older engines and chassis, and lack infotainment systems as good as Chevy’s MyLink. Truck buyers are incredibly loyal, and so the notion of an American midsize pickup for all your weekend activities carries a lot of weight. 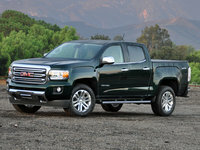 The Colorado and its cousin, the GMC Canyon, are also the only two midsize trucks sold in America with a diesel engine. With all these attributes in mind, it’s easy to see why someone would pay a premium for a midsize pickup, especially when it has been as good as the diesel, Z71 version of the 2016 Chevrolet Colorado. 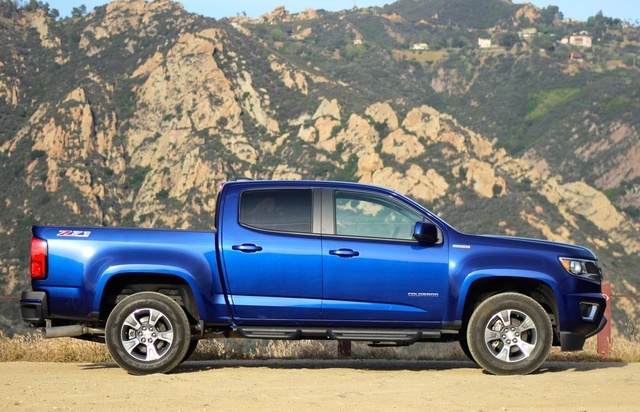 What's your take on the 2016 Chevrolet Colorado? Gary I just bought a 2016 V6. A beautiful truck inside and out however I am not impressed with the fact that you have to stand on the gas pedal to get it moving. Scott I think I'll keep my 2010 Colorado with the 5.3 V8. Sounds like the new gen Colorado is under-powered, just as I thought it would be with a V6. The fact that GM doesn't offer the truck with a V8 is disappointing in itself. I can't justify what I would spend on a new Colorado optioned out like I would want. Might have to look at the upcoming Ford Ranger in 2018. Richard Read at least 3 different reviews by different outfits. Then combine the average findings (section by section) and divide by three. IMHO it's the only way you will get a more true picture of what is going on. Users ranked 2016 Chevrolet Colorado against other cars which they drove/owned. Each ranking was based on 9 categories. Here is the summary of top rankings. Have you driven a 2016 Chevrolet Colorado? Will 6 bolt Colorado rim fit a full size gm? Truck has not been driven for a week due to being on vacation. The first time I drove it the rear driver brake smoked and stunk and got very hot! It actually boiled water I put on it. Huntington Toyota is a classic bait switch shyster operation Check the reviews I firsthand experienced there game playing illegal tactics. Why do you permit them a platform to advertise ?